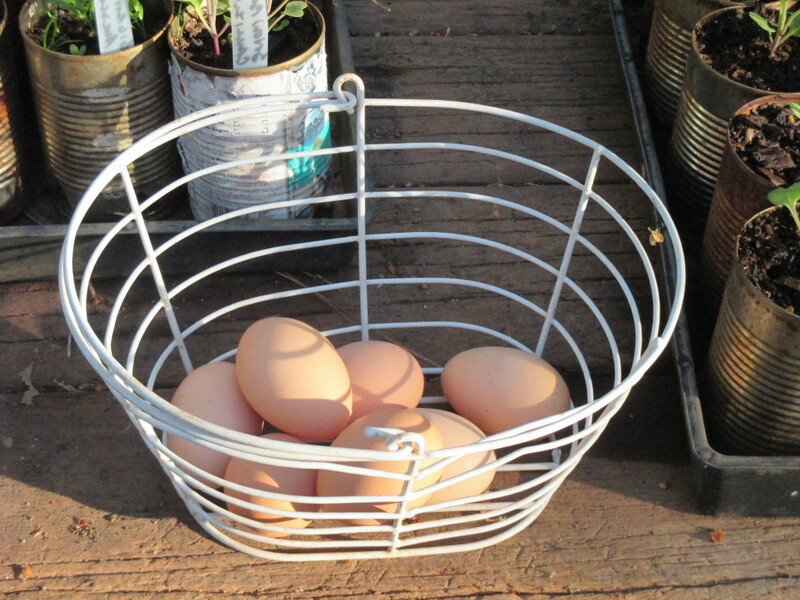 Eggs – it’s what’s for breakfast. When George Gershwin composed the song It Ain’t Necessarily So, he was onto something. I’d love to have a nickel for everything I was taught or told or just accepted as fact in the course of my life. From food preservation to gardening to animal husbandry to medicine to finance, there have been a lot more ‘not-so’ things than ‘so’ things. A while back I did a post on not needing to waterbath jams and jellies; I got more than 100 comments corroborating my “not-so” position. At which point it occurred to me there are lots of other not-so things out there, and shazaam, I had an ongoing blog topic. Here’s the latest “it ain’t necessarily so” (IANS). There’s been plenty of good research out there to contradict that notion for at least 20 years, but it wasn’t until 2015 that the US Food and Drug Administration and a few professional medical organizations finally admitted that eating cholesterol did not cause heart disease and people didn’t need to restrict their intake of eggs (especially real farm eggs laid by chickens that run around in the sunshine on green grass and eat bugs, grass, weeds and everything else they can get their beaks into the way chickens should). Having a high cholesterol raises the risk of heart disease. Nope. Having too low a cholesterol level, however, may increase your risk of cancer, depression, Parkinson’s disease and violent behavior. Back in my youth as a nurse, before the cholesterol-lowering drugs called statins were even a gleam in a researcher’s eye, a ‘normal’ cholesterol reading was quite a bit higher than today’s recommendations. In those days, a reading of 220 was considered normal. Today, the recommended reading is 100 to 199. Now, how do you determine what’s normal? Well, the first thing you do is invent a test that can measure cholesterol in the blood of humans. Then you go out and collect a very large assorted group of people, preferably a mix of ages and genetic backgrounds and both sexes, and you start testing cholesterol levels. If you only test Caucasian men over the age of 50, your normal is likely to look very different than if you only test black females under the age of 40. If all of these people were healthy when you tested them (and the researcher should weed out anyone who isn’t healthy as that could bias the results), you could then follow them for 20 or 30 years and see what happened to their cholesterol levels. Maybe cholesterol levels naturally rise or fall a bit as we get older (there’s some pretty good evidence that they do). In what is called the Honolulu Heart Program, researchers followed over 3,500 Japanese-American men for 20 years, tracking cholesterol and other blood fats along the way. They found cholesterol fell as the men got older. They also found that the men with the lowest cholesterol readings had an increased risk of death from any cause. Sadly, their comment was, “We have been unable to explain our results.” In other words, “our findings are so contradictory to the current politically correct version, we’re speechless.” They did at least redeem themselves a little by adding that their data says elderly people should not be given drugs to lower cholesterol. Other research says women average a higher cholesterol level than men, but they have lots fewer heart attacks (as long as they don’t smoke). What’s also very interesting about the idea of a ‘normal’ cholesterol reading is that the medical establishment keeps lowering the target. Now, let’s think about this. Cholesterol is so important to your body that if you don’t eat enough of it your liver will make it for you. Dr William Castelli, a former director of the famous Framingham study, which has been used to justify restricting cholesterol in the diet to lower body cholesterol, commented in 1992, “In Framingham, Mass., the more saturated fat one ate, the more cholesterol one ate, the more calories one ate, the lower the person’s serum cholesterol. The opposite of what… Keys et al would predict… We found that the people who ate the most cholesterol, ate the most saturated fat[and] ate the most calories, weighed the least and were the most physically active.” Can’t get more definitive than that. In 2004, a panel of medical and scientific experts decided Americans should have lower cholesterol numbers. They decided LDL (low density lipoprotein or “bad” cholesterol) cholesterol readings should be 100 or less. The previous normal was 130. In order for the average human to get there, cholesterol-lowering drugs were required. There was no science to back up this recommendation (even the authors of the recommendations admitted the evidence was ‘not very strong’). Of the nine doctors on the panel, eight had been paid for some sort of service by the manufacturers of statin drugs, which lower cholesterol. Some had been paid by multiple companies. Gee, did those new guidelines create a huge market for the statin drugs? Yep, an estimated $29 billion market. Missouri is the “show me” state. The mental attitude of “you’ll have to prove it to me” is a good one. Use your common sense. When your experience or that of people you trust is contrary to accepted scientific wisdom or expert recommendations, odds are very high the scientific wisdom and the experts are out to lunch. Ask the old homicide lawyer’s question, “Cui bono?” Loosely translated as “Who benefits?” what it actually means is “To whose profit?” When big bucks, company survival or professional reputations are on the line, ethics quite often take a back seat. Circus entrepreneur PT Barnum was the one who coined the sucker-born-every-minute rule. Don’t be a sucker and remember: it ain’t necessarily so. This entry was posted in Food, Health and tagged blood pressure, cholesterol, diet, heart disease, lipoprotein, medication. Bookmark the permalink.